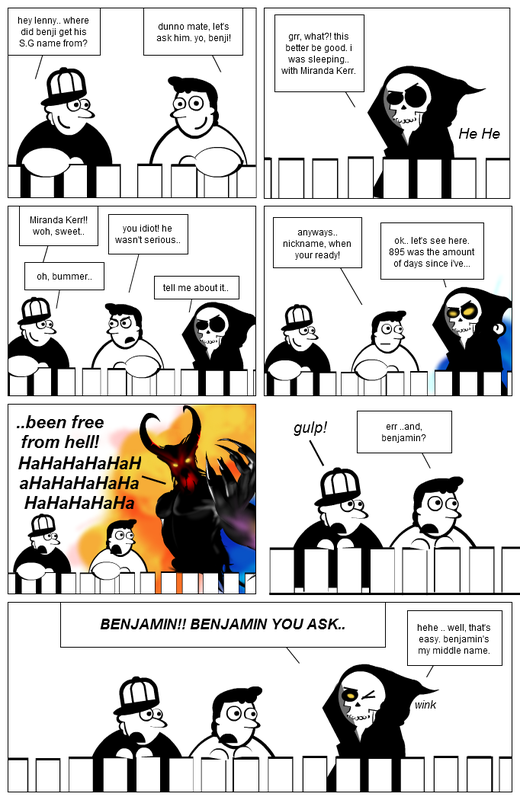 Stripgenerator.com - how benjamin895 got his name..
how benjamin895 got his name..
not very exciting.. but yes, my middle name is benjamin and the numbers 8, 9, and 5 are in my my daughters birthdate. thus i thought, easy to remember..
hey lenny.. where did benji get his S.G name from? dunno mate, let's ask him. yo, benji! you idiot! he wasn't serious..
anyways.. nickname, when your ready! hehe .. well, that's easy. benjamin's my middle name. grr, what?! this better be good. i was sleeping.. with Miranda Kerr. nice to see again those two and your story, very cool, Benny!